Please see our AVA Condo Preview and Reservation events post. 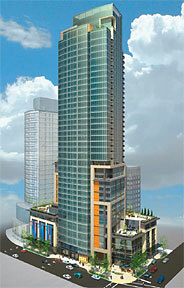 The newest project from Urban Condominiums is AVA. Formerly known as 8th & Pine, AVA will be the newest hotel / condo project to grace the Seattle skyline following on the heels of 2200, Olive8, Madison Tower, The Four Seasons, 1 Hotel, 2nd & Pike and 600 Denny. Developed by the Executive Group (hotels) and the FANA Group, the 38-story tower will include 211 condominium homes called “The Residences” situated above the 190-room luxury hotel. The hotel will reside on levels 10 through 17. Homes are expected to range in size from 700 to more than 2,000 sq ft and are topped by an 8,000+ sq ft penthouse. The upper level homes will be known as “The Estates”. Residential units are expected to be priced from the low-$400,000 to over $5 million. Homes will feature European-inspired interiors, 9.5 to 12 foot ceiling heights, large balconies / solariums and air-conditioning. Hotel amenities will include an outdoor heated-swimming pool terrace with cabanas, a Skybar, fitness club, spa, business center and a “signature” restaurant. Residents may also partake in hotel services – housekeeping, valet parking, in-suite catering and account privileges at the restaurant and bar. AVA has a lot going for it. Its location places it close to the retail core, the convention center and the Paramount Theatre (map). Yet, with its location, potential buyers should consider that a number of other buildings will be developed in close proximity such as Olive8 and the Olivian Tower which may hinder views. Hotel has to be on more floors than 8-13…that’s only six floors. At a total of 142 hotel rooms, thats about 24 hotel rooms per floor. I’m excited about this project. I’m excited too, but I’m NOT EXCITED about the Marketing firm for this project. i’m looking forward to this project-it has a real upscale feel to it. they seem to be carving out a special place for themselves in the market . i’ve been seeing the advertising in the local press and saw the liveaatava.com website- it comes across very relevant, original and impactful. i look forward to getting more info on it. 445′ won’t be the tallest. That’ll be Olive 8 at 460′. If 5th & Stewart gets built that’ll be 500’+. The architecture of the building looks pretty amazing. I look forward on getting more information on it. Is it true that is a Canadian developer building AVA? One half of the development team is Canadian – The Executive Group based in Vancouver, British Columbia. The FANA Group is local. Thank you for your reply Ben. What exactly is being build next to AVA? I talked to one of the construction guys and he said that will be retirement home? The new building directly North is an apartment building called the Olivian Tower, I don’t believe it’s a retirement home. To the NE is the Olive 8 Condo project. There’s a senior living development called the Mirabella being constructed at Denny & Fairview which may be what the construction guys were referring to. (the Camlin hotel) does it really need to be this tall? Directly next to the olivian and the olive 8 so great if you want to look at a brick wall!